When I was 10, I piloted an Apache gunship with my dad. Tomahawk for the 48K spectrum was a gunship simulator which managed to combine the technical aspects of flight simulators with the sheer, visceral glee of unleashing missiles on Bad Men. The graphics were almost non-existent, the anti-piracy security measures meant you actually got to play the game one time in three, but it was a completely immersive experience. Flying low and fast over a wire frame war zone, the game dragged me all the way into its minimalist world and put me at the top of its food chain. It was, in the words of the New Games Journalism, an imaginary place and one that I was happy to visit. "This makes us Travel Journalists to Imaginary places. Our job is to describe what it's like to visit a place that doesn't exist outside of the gamer's head - the gamer, not the game, remember. Go to a place, report on its cultures, foibles, distractions and bring it back to entertain your readers." Six years ago, Kieron Gillen wrote The New Games Journalism in response to what he saw as a failure to engage with the unique way that computer games entertain players. You interrogate a computer game, meet it in the no man's land between user and text and in doing so craft an experience which may not be unique to you, but certainly feels like it is. Or, to put it another way, you can watch the sun set from anywhere in Vice City whereas you only ever see it from one angle in a film. In essence, he argued that the sunset doesn't matter, but where you watch it from and how you got there, does. "New Games Journalism exists to try and explain and transfer the sensations allowed by videogaming to anyone who's willing to sit and take time to read it. It asks the question 'Why game anyway?' and then gives as many answers as there are people, as interesting as people, as precious." The manifesto was embraced by some elements of the online community and was even mentioned on several occasions in the U.K. newspaper The Guardian as well as the New York Times. Gillen's manifesto also burnt out surprisingly quickly, frequently criticized for taking a needlessly academic, even pretentious approach to what is, in essence, a product review. The serious approach taken by many New Games Journalism writers also laid it open to attack, with UK: Resistance's Seven Point Manifesto detailing the problems with New Games Journalism, starting with "The Writer is Not The Most Important Person" being a pretty definitive deconstruction of the approach. The New Games Journalism (NGJ) is now six years old, a geological age in a media where last year's game is prehistoric news. Even though so much time has passed, Gillen is still a passionate advocate for games and is fascinated by how the landscape has changed, something which became clear during our email conversation. He's an articulate, funny interviewee, brimming with the combination of self-deprecating humor and rock star confidence that English comic writers of his generation (He was born in 1975) exhibit, many of whom cut their teeth on Warren Ellis' legendary message board, Whitechapel. I first talked to him when we both worked on 9th Art, a comic journalism website that sprang from Ellis' board and he's lost none of his natural authority and savage sense of humor. 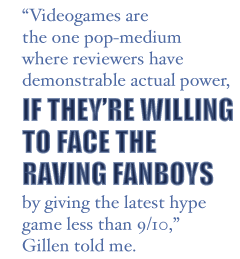 "Videogames are the one pop-medium where reviewers have demonstrable actual power, if they're willing to face the raving fanboys by giving the latest hype game less than 9/10," Gillen told me. I don't know if that statement is true, but it's just the type of thing that Gillen says.